September, 2016 - During last 6 weeks Landlordy received number of updates that are focused on improvements for photo and document attachments and reminders. Ah, and iOS10 support as well. 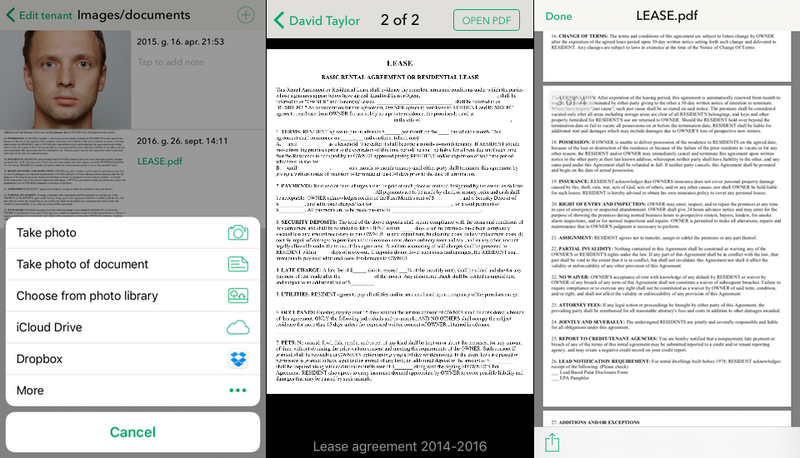 Since version 1.7.0 you can you can save, view and share PDF documents in Landlordy in addition to photos/images. PDF document support is available for Personal Edition users only. You can attach PDFs and images from other apps and cloud services - e.g. iCloud, Dropbox and other apps that provide document selection pickers for PDF files. Landlordy will keep copy of all attached files and you will be able to share them from the app or export them together with reports. To view or share PDF file, tap on document preview and then press [OPEN PDF] button. You can scroll, pan to zoom section of the PDF document and tap to see document in the full screen (tap again to get navigation bar and toolbar back). Use share button in the toolbar to print, send PDF document to someone via Mail or Messages app or save it in other apps that support PDF documents. You can attach images and photos not just from camera and your Photo Library but also from third party apps and cloud services (e.g. Dropbox, Microsoft One Drive, Google Drive and other apps that provide document selection pickers for images/photos). Landlordy will keep copy of attached images and you will be able to share them from the app or export them together with reports. While you were able to add your notes to images/photos in Landlordy before, previously they were visible only in Edit mode. Since version 1.7 your notes on photos/images are displayed at the bottom of image when you preview image. If you share photo/image, your notes on picture will be shared as well. 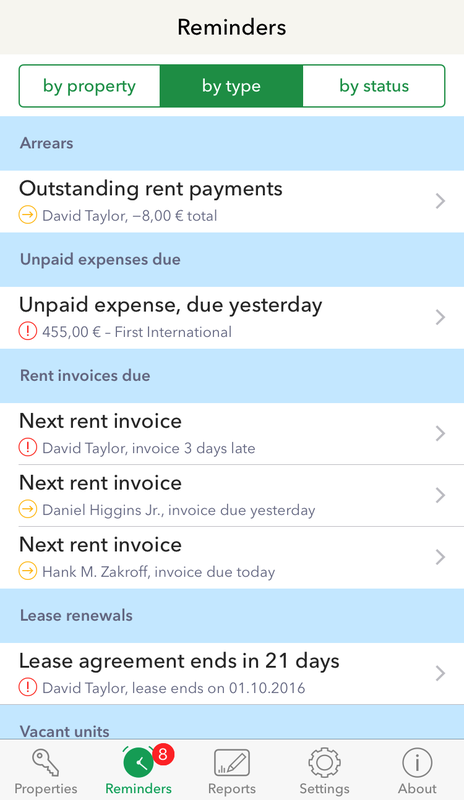 To help you focus on most important things first (helpful when you have large number of rental properties) we added option to group reminders by their type and status. As before, you can enable and disable certain reminder types in the Settings tab. Of course, we also updated app for iOS 10 compatibility. 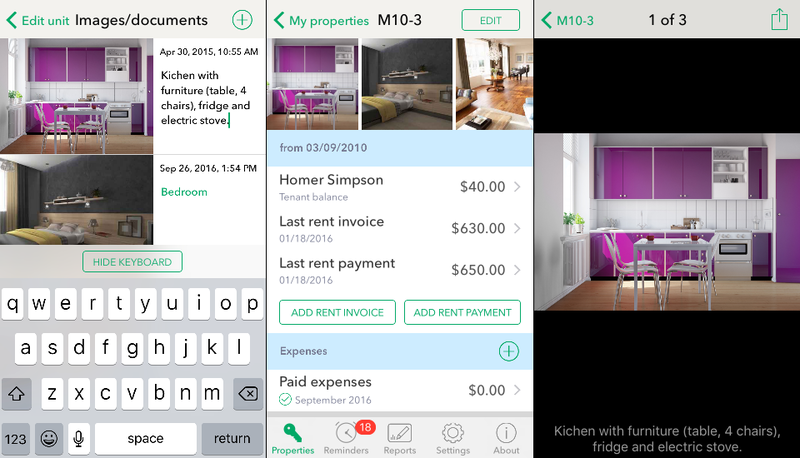 To use latest iOS features and to keep our app update efforts reasonable, Landlordy now requires at least iOS 9.3. We recommend updating your device to latest available iOS version to keep your device secure and to access latest features in Landlordy and other apps. If your mobile device does not support iOS9, you will always be able to download latest compatible Landlordy app release in the App Store app - see Purchased section in the Updates tab. Can We Ask For Some Help? We would be thankful if you can find a moment to add or update (if you have rated Landlordy before you would not need to write review again, your last review text can be submitted/updated) your rating/review for Landlordy in the App Store (see in the Settings tab). The way App Store currently works is that app ratings are reset on every update. Every time we ship update with new features or bugfixes, Landlordy starts with zero ratings. Sad, right? You can help!